VIDEO: UCRRA Host Informational Meeting on Single-Stream Recycling Rate Hikes and Discontinuation of Program. Plan to attend the upcoming public hearing on June 14th at the Ulster County Legisaltive Chambers at 5pm to speak to UCRRA’s proposed plan to discontinue single-stream recycling (in 2019) and to raise rates in the meantime (effective July 1st, 2018) as well as to click on the following EMAIL hyperlink to send the following request to members of the Ulster County Legislature, UCRRA Executive Director and City of Kingston Mayor. – City of Kingston Mayor Steve Noble. 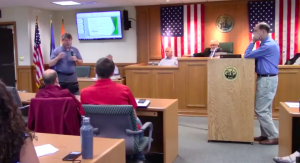 On Thursday, May 23rd, the Ulster County Recovery Resource Agency (UCRRA) held an informational meeting on the current climate of single-stream recycling, it’s plan to raise rates as of July 1, 2019, and to discontinusingle-stream recycling as of January 1st, 2019. UCRRA Proposes to Raise Rates and Discontinue Single Stream Recycling. According to a chart presented during the meeting, UCRRA became aware of a changing Chinese market for single stream recycled materials in October of 2017. As I understand it, although potential rate hikes had been discussed at around this time between UCRRA Executive Director Timothy Rose and City of Kingston Mayor Steve Noble, the decision for the county authority to discontinue single-stream recycling was learned from in a newspaper article released only one month ago. 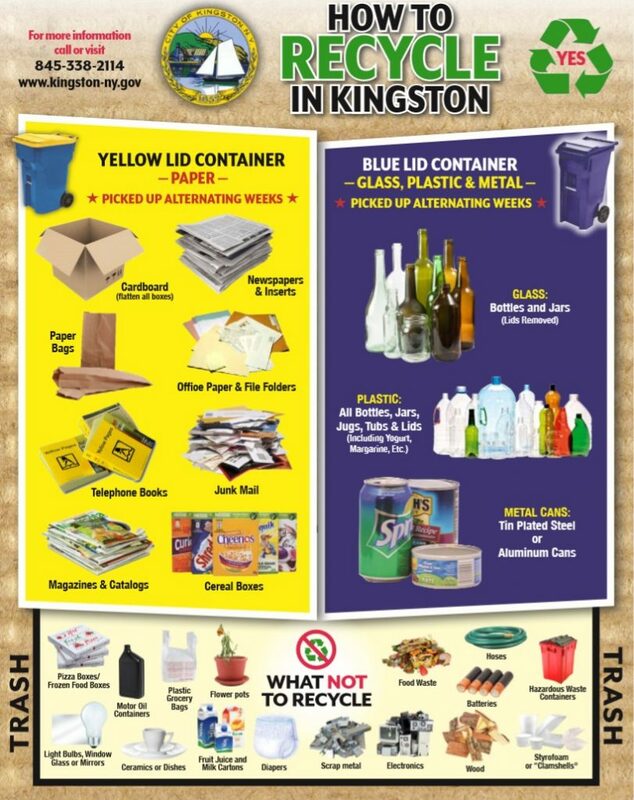 Currently, the City of Kingston pays $20 per ton for comingled recycling materials. UCRRA claims that new categories have been formed, where rates will be $56 per ton for a ‘clean load’ (minimum contamination) or $107 per ton for a ‘dirty load’ (maximum contamination). “Material Recovery Facility’s (MRF) are extremely expensive to operate. You are looking at labor costs, electrical costs.” Description of an MRF is here: 24:10 – 25:05. “It’s a state law in your enabling legislation. If we can get the state to amend it, the county should have a plan for recycling so that we can be in charge of our own destiny.” – CoK Mayor Steve Noble. “The point I believe of UCRRA is to have a coordinated countywide approach. The reason the agency came into existance was so that individual towns in the coutny wouldn’t be in charge of managing their own solid waste or recycling…with a proposal to stop accepting single stream and for the City to deal with it themselves and work with the same vendors that the coutny is working with, is again starting to shift their responsibility of countywide solid waste management to individual towns and communities. That’s a large policy shift, and the residents of the county should have a more robust dialogue…..my transfer station is only open 1 1/2 days a week and we only have one way master. We are only talking about 2,000 tons of single stream recycling per year. That’s 30 tons a week. We have 8,000 tons of trash. The cost of managing 2,000 tons a year of single-stream, there is an efficiency of scale…if we stopped bringing single stream to you all, I don’t think you’d be laying off employees. It fits into the work load of the agency. it would just be passing that cost on to the city. Some of tipping fee ($103 per ton) goes to the agency operation. We help pay for overhead, the MRF, any other activities. We are already contributing as well as paying the $20 a ton.” – City of Kingston Mayor Steve Noble. “Our five-year contract with Senaca falls is up in a year…landfills are closing around the state, so I’m nervous about what will happen next year that will take effect as of January 1, 2020. We’ve done our due diligence. I’ve known this was coming down the pike, and we’ve been saving for this time. Agency is planning to operate with a deficit to move things up incrementally. The good news is that we’ll keep the tipping fee the same for another year….though the landfill may be at capacity at 2025. “There is a certain amount that we can take, 80 tons a day, 400 tons stored. We’ll store bales of material when the market is low, and watch the market to decide the best time to sell. The market can be low enough when we hold onto materials. If we don’t accept single stream, it will be a benefit for us, as we’ll have more space. We can store when times are bad, and sell when sales are high. This can help to keep the tipping fees low.” – Tim Rose, ED UCRRA. There will be no decisions made tomorrow evening. We encourage the public to take advantage of this opportunity and ask all of the questions that they might have. We’ll be creating a post for the upcoming public hearing on this matter in June with clear recommendations. There is no information on who will sit on the panel, or what the overall agenda will be to share here. The Mayor of Kingston plans to be in attendance. 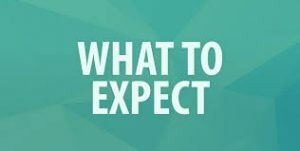 In this week’s City of Kingston newsletter, Mayor Noble says, “As many of you are aware, the Ulster County Resource and Recovery Agency (UCRRA) has made reference to proposals that, if approved, will significantly impact our community. In addition to the Agency’s proposal to double recycling fees mid-year, the Agency is considering discontinuing its acceptance of Single Stream Recycling…I will be attending both of these meetings and strongly encourage all of you to consider attending as well. …and can listen specifically to my comments at approximately the 1 hour and 22 minute mark. As you will hear, the issue is much larger than whether we have single stream or dual stream recycling- we are on the brink of an international environmental crisis. While Single Stream Recycling may be the focus today, the fact is that no matter how recycling is collected, there are fewer places for the recycled materials to go at the moment. Whereas recycled materials used to be a valuable commodity, the market has shifted, at least temporarily. Two years ago when UCRRA was collecting increased revenue from recycled materials, discontinuing Single Stream Recycling was not up for discussion. I firmly believe that recycling policy should not be dictated solely by market conditions. It is time forÂ the Ulster County Legislature to institute flow control for recyclables, call for the review, update and approval of the long-awaited Solid Waste Management Plan for Ulster County, and reestablish the Recycling Oversight Committee of the Legislature. Kingston resident Kate Lawson leads by example. “Leave It On The Lawn, Kingston!” initiative continues for a second year in the City of Kingston. 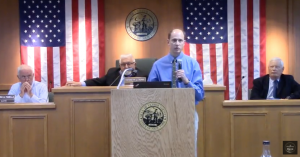 The City of Kingston’s Mayor James Sottile, DPW Superintendent Michael Schupp and The Kingston Land Trust hope to save Kingston citizen’s tax dollars for a second year by encouraging residents to mulch their leaf landscape waste. 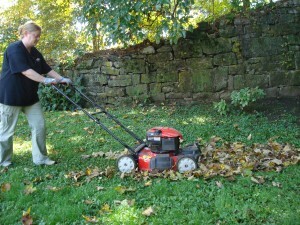 KINGSTON – With the recent passing of a mandatory leaf bagging law in the city of Kingston, public officials in connection with the Kingston Land Trust are asking residents to “Leave It On The Lawn, Kingston!” for a second fall season. 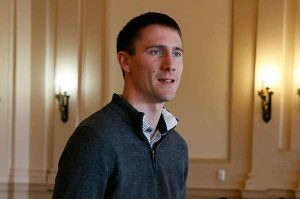 The federal program that was initiated locally hopes to save citizen’s tax dollars by asking them to ‘help Kingston help itself’. With the abrupt change made this week to the recycling schedule (that is now bi-weekly) we grew deeply concerned. Not because we think weekly pick-ups are ‘the way to go’. But because the change was made without any effort to inform or educate the public. As it is, through the hard work of Julie and Steve Noble and Jeanne Edwards, Kingston was sort of on the up and up on improving it’s recycling numbers. That might be history unless something is done and soon. Sure, not every municipality offers recycling to their residents. That may even be where we are heading. The fact of the matter is, Kingston has offered it as a service and we have come to expect it. If more people now feel inconvenienced and decide to trash their plastics and all, we are not only heading in the wrong direction but we are also encouraging a whopper of an expense in the long run. Why? At this time, Kingston pays UCRRA (Ulster County Resource Recovery Agency) $71 a ton to then ship our garbage up the river some 250 miles. That’s what makes it so expensive. Weigh that against the national average, which is around $42.08 per ton. Landfills are close to capacity. Perhaps not this year or next, but in the very near future our garbage may be shipped even further away. Now does that make any sense? So please, hold onto your recycling until your new scheduled pick-up day. Give your bottles and cans an extra wash out to prepare them to sit for a week longer. That only takes a few seconds of your time. If you simply can’t wait, delivering your recyclables, yard waste and brush to the transfer station is free. Encourage your Alderman to help solve this problem through good discussion and solid examples by looking outside of Kingston to see what might be useful to us. KingstonCitizens.org: Why Pay As You Throw? It’s here, again. Looking at the calendar I can’t deny it anymore. The holidays are coming even if I’m not ready. Once this indulgent time of year has passed, what’s left behind will be evident in what’s put out curbside. Plaintiffs’ exhibit one being the Christmas tree. I suppose there’s an ongoing debate over artificial versus real trees. I fall on the side of bah-humbug with regard to all things Christmas. But if it became compulsory to display a Christmas tree and I had to make a choice between a real tree or its artificial counterpart, I would choose real any year. Last year 28 million real Christmas trees were sold in the US. They are grown in each of the fifty states and Canada. With nearly 21,000 tree growing farms, the industry employs more than 100,000 full or part time annually. Trees are a renewable, recyclable resource. For every tree harvested, up to 3 seedlings are planted. An acre of tree farm can provide enough oxygen for 18 people, while also providing a natural habitat to a variety of animals. Once the glamour, glitz and glory of the holiday fade, all those trees begin their journey to their final resting place. In Kingston we have two organized options available to local residents. Bring your family and your tree to the annual Winterfest event held at Hasbrouck Park on January 16th between 10:00 – 2:00. Your tree will be mulched for free! You can take your mulch home with you or leave it to be distributed and used in Kingston’s extensive park system. This growing and popular event is sponsored by the Kingston Parks and Recreation Department and the Friends of Forsyth Nature Center. Other planned activities include snowshoeing lessons, snow animal building contest and children’s crafts. The latter will be held inside of the heated and historic Hasbrouck Park Stone Building. For directions to the event, click here. If you are unable to make it to Winterfest, you may place your defrocked tree curbside for pickup through Jan 31st according to the city code. 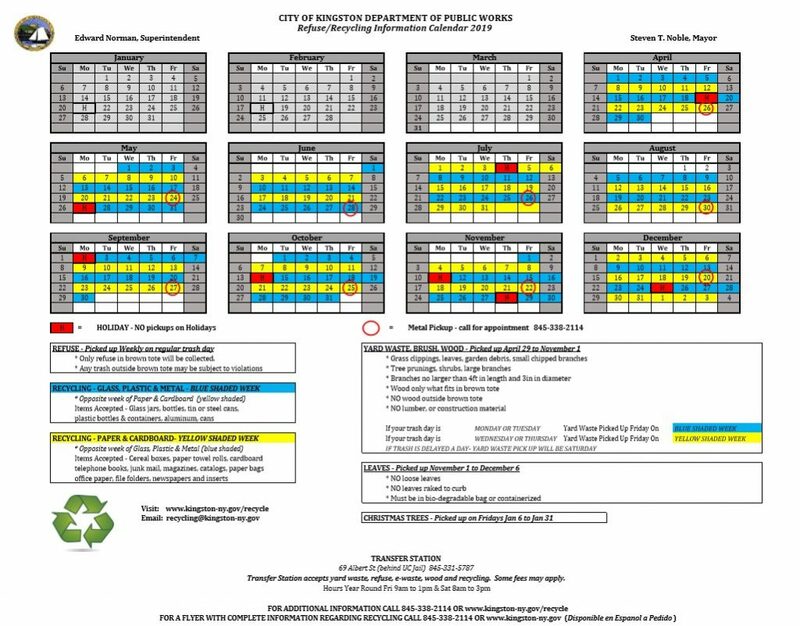 Please note that if you get your tree out before January 16th the DPW will transport them to event site for chipping. Any trees hauled away after that date will go to our local brush dump. Still want more green tips for Christmas? Check out these ideas. Did You Know: 85% of artificial Christmas trees are manufactured in China and are made with non bio-degradable plastics? After an election cycle, have you ever wondered what to do with those campaign lawn signs that you agreed to place on your property? Do you call the candidates and offer them back? Take them apart to recycle them? Re-use them for lawn sales? I decided to take a look on-line to see if New York State had any lawn sign recycling program in place. Nope. At least not so far as I could see. There are, however, several municipalities who have created such a thing (in Florida for example and of course California). I wonder if those running for office would agree to do away with lawn signs. Not plausible? Then how about holding onto them to re-use in the case that they run again in the future. Most everyone has an attic, right? Here is a good link to ‘Planet Green’ where you can read more about the recycling possibilities.